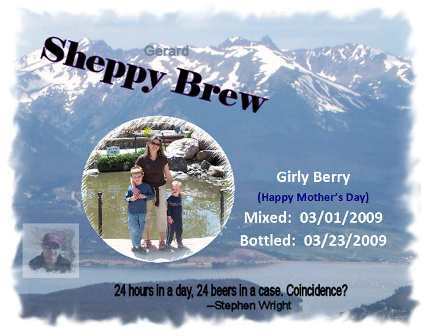 Well, Mr. Beer has a recipe called Mountain Raspberry, which I ordered to make a Fruity Beer for my beautiful beer model to be ready to drink on Mother's Day. As it turned out, neither my Beer Model nor I really cared for the raspberry in the beer. But, I could not help but think that the "real" beer taste wanted to come through and make this a great beer. So, I decided to make this recipe without any raspberry. I am still calling it Girly Berry as a sort of inside joke. My original plan was to make exactly the same beer minus the raspberries, but when I finally got around to making the recipe, I decided to change it up some based on ingredients I had at hand. And... as expected, it turned out much better than the version with the fruit in it. The comination of Saaz and Perle hops along with whatever hops are used in the Mr. Beer High Country Canadian Draft and the fermentation a bit on the high side with the Mr. Beer yeast actually yields an almost fruity tasting profile. My wife even said it had just the right amount of raspberry. Turned out good enough that I will probably make this again and maybe several more times. This will probably be a regular in my lineup especially in the spring and summer. Brewed it up. Had some issues with following the recipe, so this is now modified to match what happened. The honey I had was a bit crystallized, so I think maybe I got more gravity points out of the same weight. Really overfilled to get close to the 1.055 OG. Finally got around to bottling this. Really good attenuation. Think maybe the Mr. Beer Dry yeast gets a bad rap. Sample tastes just as I think it should. Used 2.25oz sugar in just over a cup of boiled water for priming. Got 2 liter and 21 12oz bottles. Yesterday, put these all in the conditioning cooler. Today, I put 6 into the beer fridge. Tried some today while brewing my BPA. Little more estery ("Mr Beer Taste") than my last batch of this. Next time I brew this, I'd like to make the OG closer to the 1.062 of last time. Maybe also some more Saaz hops to flavor. Will let this condition a significant time before putting the rest into the beer fridge. Tried another From the first group in the fridge. Still got the mr.b taste. Tasted again. This beer is right where I want it now. I guess all it needed was some time in the fridge. Yum. Tried another. Happy with how this is tasting. The esters are there, but blended nicely into the malt an hops. Fruity, light, crisp, clean. Nice girly beer. Might have something to do with the dragon spit II I had before but the fruity esters taste Belgium to me. Nice. Finished up the last liter. Still a pretty nice beer. I guess I will have to get this brewed again.